This is my body, which is given for you. Do this in remembrance of me. I work in the air-medical transport community and over the forty-plus years of its existence, our industry has lost more than 300 of its associates in the line of duty. An air-medical accident – most commonly a helicopter crash – usually occurs because of poor decision-making on the part of one or more people. Of course, we all make poor decisions, but some decisions have more severe and irreversible consequences than others. In most public-service endeavors – EMS, fire, law enforcement, military – losing a comrade in the line of duty creates sudden, long-lasting, and violent shock-waves that reverberate far beyond the family and friends of the ones lost. Remembering is important. Near the end of the last meal with his disciples, Jesus blessed and broke bread, poured wine, and told his closest companions to remember him every time they ate and drank. This request was not made out of a narcissistic fear of being forgotten. Rather, the request was made out of a knowledge that his friends – and us today – would need to remember, not for his sake but for ours. Whenever we form a close bond with another – through marriage, friendship, or profession – we become a part of a family that is larger than our single existence. When we lose a person in that family, we often need to re-member, to reestablish and celebrate that bond, and to have that person in our presence again, if only in our memory. Some are reluctant to dwell on memories of loved ones because they find it too painful. In reality, it may be more painful not to remember. In his book The Seven Storey Mountain, Thomas Merton writes, “The truth that many people never understand, until it is too late, is that the more you try to avoid suffering, the more you suffer, because smaller and more insignificant things begin to torture you, in proportion to your fear of being hurt.” Cherished memories may hurt by reminding us of what we have lost, but repressing those memories will hurt more. Keeping the memory of a loved one alive helps our healing process. Indeed, when someone close to us passes, remembering is a primary way to reconnect with them. We cherish items they valued; we return to the scene of the accident; we linger over their pictures. By remembering, we bring a past reality to the present again. While the memory is not as tangible as the reality was, it often allows for a renewing of our focus on today and tomorrow. We remember the sacrifice and the love of others who valued us enough to put their lives on the line for us. We remember our spouse, our friend, our co-worker, our Savior; and the memory of that bond strengthens us today. When we remember, we honor our loved ones and keep their impact upon us alive. Come home to church this Sunday. Re-member into the family of God. My song, Never Forget, can be heard at my website, www.ContemplatingGrace.Com. I grew up in church, attending nearly every Sunday with my family. It was an expectation that I accepted, although church was never particularly meaningful to me. I assumed God’s presence and goodness, although I never really felt or experienced it. I listened to stories of God appearing to folks in the Bible as a burning bush or in a cloud of fire. In Bible times, God spoke through dramatic visions and booming voices. The stories left no doubt of God’s presence. I, however, never saw or heard anything of the sort. If God was present with me, I assumed God was a silent God. One Friday evening in December of my fourteenth year, my father and I were sitting in the car in front of our home visiting about Christmas. He told me of the painting he bought to surprise my mother. He talked about his work, and I told him about school. Early the next morning, my father lay dying on our bathroom floor from a brain aneurysm. Bible stories seemed clear that God was always present in challenging times, and my times were challenging. Even so, God’s silence was deafening. Not long after my father’s death, I stopped attending church. I did not stop believing there was a God, however, I just no longer believed in the God I had been taught about in church. Retrospective has always been a good teacher for me. As I ponder the events of my earlier days, clarity often comes that was not present at the time. In the years following the passing of my father, I could not hear God because I was listening for a supernatural voice, or perhaps seeking something as dramatic as a burning bush or a pillar of cloud. I now know I could not find God because I was looking in the wrong places. God came to me many times through those difficult years, and I ignored God’s voice and care because it was too ordinary. For example, my best friend seldom left my side during the toughest days – not because he had words of wisdom to share, but because he did not want me to suffer alone. In retrospect, it is clear that God was not silent. God was always present. I was simply not in a frame of mind to recognize God working through my friends and family and surroundings. Their love and attention was sufficient to carry me through my darkest days. I wonder how many God-inspired acts of kindness and compassion I missed because I was looking for something dramatic. No, we do not worship a silent God. We worship a God who often speaks and acts through very human channels. In a touch, a hug, or a kind note. Like a baby born in a manger, or the son of a humble carpenter, sometimes God chooses to manifest in simple ways through ordinary folks. Come home to church this Sunday. You may find God waiting for you there. My church family lost a precious member to depression last week. I am not a mental health professional, but my father had, and one of my siblings still struggles with mental illness – specifically, bipolar disorder. What follows is an image that is helpful for me in contemplating this perplexing disease. 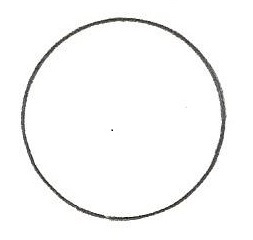 This circle represents my reality. 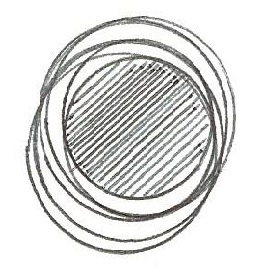 Everything that is real to me exists within this circle. While I know there is much that exists outside of my circle, it is not part of my reality because I either cannot perceive it or I cannot understand it. The colors of the light spectrum my eyes cannot detect is an example of a reality I cannot perceive. Similarly, I cannot understand nuclear physics – I do not have the mental capacity or training to grasp the concepts and allow them to exist in my circle of reality. Here is a view of reality within a community. 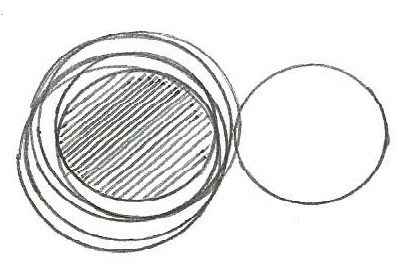 Everyone’s circles are different – some larger, some smaller. The shaded area represents the shared reality of the community, or that which everyone agrees to be real. Most people have areas that are either not perceived or not understood by others in the community and, thus, are not real to everyone, but there is a significant amount of shared reality. A person whose circle of reality once fit with his or her peers’ shifts, and the circles of reality no longer intersect, or only intersect partially. We often label this type of episode as psychotic. Paranoia and unclear thinking are common, as are hearing voices no one else hears and seeing visions invisible to others. Actions and thoughts are difficult to understand or explain because they originate in a reality we cannot grasp. What a person experiences in this state is not real to the rest of us. They may not run around naked and live among the tombs, as did the man with the demons in Luke, but their reality has definitively shifted. Unfortunately, it can be challenging to recognize anything is significantly wrong until the person’s circle of reality has moved enough to make them nearly impossible to reach. Severe abuse of self or others may result, even from those who are typically loving and gentle. Sadly, I do not have wise counsel for how to deal with mental illness. When we suspect someone is experiencing a mental shift, it is sometimes helpful to do what we do with others when they suffer – keep in touch, ask questions, encourage them to seek help, follow-up, and reassure them. Perhaps our love and attention can help draw a shifting circle of reality back into our shared realm. Sadly, we cannot bring everyone back; but we can maintain tight communities, like churches and support groups, where those who are suffering can feel welcomed, safe, loved, and accepted. Come home to church this Sunday. Expand your circle of reality.